A couple of cousins created a family facebook page awhile ago. It’s the virtual front porch we don’t have anymore, a place to take your coffee mug (or wine glass) and “sit a spell”. It’s still new to us, we don’t really have any structured way to keep track of what’s being discussed, but that’s authentic – it’s how front porch chats used to go anyway. If there were more than two people, there was always more than one conversation – which daughter had a new fiance, the merits of Studebaker vs. Chevy, and did anybody remember the name of that guy who used to live up north of Uncle Paul’s place… I’m glad that it’s not just us Boomers participating, it’s good to know that the younger generations are interested, too. And the big plus about facebook, as opposed to the old front porch, is that you can roll your eyes and no one has to know! “My earliest memories of the Doodle Bug are my dad’s games that he played with it. 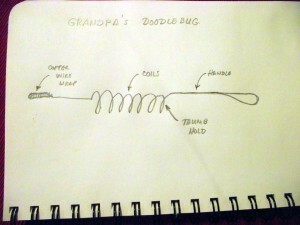 The Doodle Bug was a piece of wire coiled like a spring with a loop of wire for the handle. The tip of it, about one inch long was wrapped with copper wire. When I was very young he would give one of us kids a penny and tell us to hide it anywhere in the room. He would take another penny and hold it, clasped in his left hand and hold the Doodle Bug in his right hand. He would then start searching the room and as he got near the hidden penny the Doodle Bug would start going up and down as though it were alive. When he got directly over the hidden penny, the end of it would start going in a circle very quickly almost as though it were alive. It never failed that the hidden penny was right below the mad, whirling wire called a Doodle Bug. He also used this as an entertainment for people, when he and my older brothers and sisters went to the hop yards in the fall to pick hops. At one time I was taken down there to see what the hop picking was like. In the evening the people would all gather around a big camp fire for a little relaxation and social activity. My dad would then give several hop sacks (like a gunny sack only bigger,) he would then ask several mothers to put one of their children in these sacks and line them up. He would not know whose child was in which sack. He would then choose a mother and take her right hand in his left hand and clasp all her fingers with his fingers. He would then take the Doodle Bug in his right hand and start down the line of children in the individual hop sacks and when that mother’s child was directly in front of him the Doodle Bug would just go wild, just like it did when it found the hidden penny. I’ve seen him spend many evenings entertaining people with these little performances. I was always very skeptical about this but now I really believe that he really had a unique way of magic with his little piece of wire that he called a Doodle Bug. 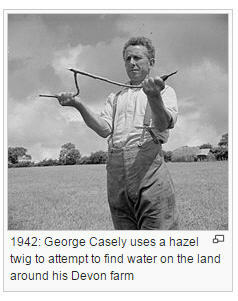 In all his years of mining he used this little gadget to find where the veins of gold were. And the oil in our property was also detected by him with his little magic wire. He also said that many years ago he found uranium on our property. Who knows, maybe some day that will prove to be true. Another thing that comes to my mind is the story of the drowned child in a lake in or near El Paso, Texas. As my memory goes, there was a child drowned in a lake. They had searched for a long time for the body and had not found it. Somehow my father found out about this and contacted someone who took him out in a boat with the child’s mother. He used the method of holding the mother’s hand with his finger, clasping hers and they went all over the lake in the boat. If I remember correctly he told them where the child’s body was and also how deep in the water it was. I don’t know if the body was recovered or not. He also could detect an airplane in the air and tell you how far away it was by how many times the Doodle Bug moved up and down. This was never clear to me so I can’t say much more about it. My brother Creston, was the only one in the family who this little gadget called a Doodle Bug would react for except my father. The only other person it would work for was the little old man who lived up the hill behind Fir Point . Being a very visual learner, I wanted to see a picture. 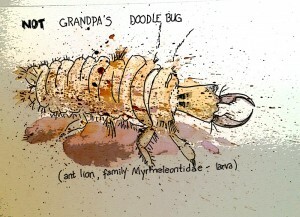 Beginning with Google Images, I tried “Doodle bug” and wound up with lots of pictures of some fairly grisly insects. Case in point, ant lions… ewww. Which was very informative and I suggest visiting that site, and I wondered if Grandpa’s Doodle Bug wasn’t a homemade version of a pendulum… but turns out it wasn’t a pendulum at all, as the sketch above shows. I also happened on to the concept of ideomotor reflexes in Wikipedia, and this I think is the key to the finding of the pennies and the identification of children under bags… the children who hid the penny would give it away one way or another as he got close – giggling, squirming, eyes widening, looking directly toward the hiding place or purposefully looking away from the hiding place. Similarly, the mothers would give it away by unconcsciously, perhaps squeezing his hand or some other “tell” when they stood in front of their own children. He would no doubt have been a helluva gambler. But I wonder who taught him his skill? Perhaps the old man Lon Aytch? It is rather disturbing though to think about locating the child’s body in the Texas lake. I fiddled around with Google for a little bit, and wound up finding no real results, but there were some pretty cool ghost stories here http://www.hprt.org/hauntedlocations.htm! But if that mother knew where the child was, had she been party to the disappearance? Also, if no body was found, nothing was achieved by the boat trip with the mother… so why even attempt it? Many questions come to my mind on this one. I wonder if maybe he was assisting the sheriff? Maybe I read too many murder mysteries. Whether he was truly gifted as a dowser, or astute about geology and geography, or just lucky, he was confident enough to reserve mineral rights. He was nobody’s fool. And we’re all in awe. Somewhere once in Grandma’s things I saw a “calling card” with his name on it, a very lovely Victorian-looking card that would not have been available to someone without money… And a reference to him attending college… there are so many questions in my mind about him as a young man. My cousin Gary sketched the doodle bug from memory and wrote this: “It’s about 18 inches total and the thumb hold is the first loop – when Grandpa was seeking something, he would hold it in his left hand near the loops, the doodlebug was in his right hand and it would bob up and down while seeking and then change to side to side when found – the bobs could also be counted for depth or mileage to the item being sought once it changed back from side to side – the device made these motions on its own, although many did and would continue to doubt it………” Cousin Peggy says the sketch is how she remembers it also. So at least now I have an image in my head of the Doodle Bug… along with more questions than answers! This entry was posted in Works on March 9, 2015 by Kerry McFall.